But they weren’t applauding for her—they were applauding President-elect Obama, who had taken a place behind her, arms crossed. It seems that they had invited him to appear at the event some months ago, and had gotten a “maybe” from his campaign team. Now, in town to meet with President Bush at the White House the day before, Obama had stuck around for Veterans Day, and decided to take a swing by the event at Arlington. “Nothing,” replied the agent, who Nina knew. “Just stand here and keep your mouth shut.” Once Obama was done speaking, the Secret Service led the President-elect, Nina, and the NABMW President, Vice President, and Secretary into the green room for a brief tête-à-tête*. Obama shook our Finance Director’s hand, and said he’d heard a lot about her. “From who? !” she asked and, when told that he’d been talking to Rep. Maxine Waters (D-CA), Nina began to worry a bit. “I used to go before her committee a lot,” Nina recalls. “I used to get in a lot of trouble.”—seems that Nina’s mom has accompanied her on a few of these Veterans Day trips, and was pretty angry that she hadn’t come along on this one. “I even saw it on videotape,” continued President-elect Obama. “Not my best moments,” Nina responded, to laughter. 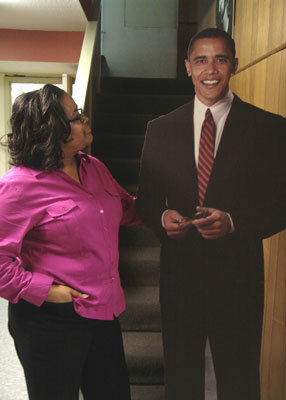 Before the President-elect left the building, Nina was sure to tell him about Cal Shakes, and about the life-size Obama cut-out (see above) that had been loitering just outside of the Finance office in the weeks leading up to the election. And then, at the subsequent luncheon, multiple speakers expressed—from the podium—their intense jealousy of the folks who’d gotten to meet our next President. *That’s what you have to call informal talks with heads of state, I think. This entry was posted in By Stefanie Kalem and tagged "Barack Obama", "female military":, "first female field commander", "National Association of Black Military Women", "Nina Maire Thompson", "theater", "Women's Memorial Vetran's Day", cal shakes, California Shakespeare Theater by calshakes. Bookmark the permalink.